Want a pair of pants that you can lounge in or pair some heels with and wear somewhere other than on your couch get all the comfort of some sweats with the sophistication of trousers. 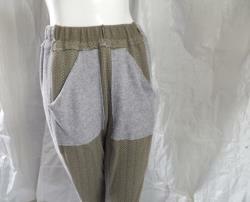 Grey stretch french terry cloth, very soft, with upcycled men's polos as the front of the trousers. Gathered at ankles with stretch cotton ribbed knit. Sage and light green small designed knit cotton front with front patch pockets sewn with overcast stitch, raw edges exposed. 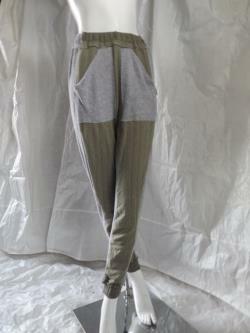 Size small/medium (6-8 pant size). Machine wash delicate, tumble dry low. Height: 5 feet 8 inches.